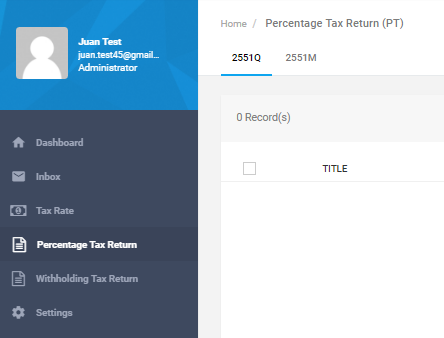 A guide on processing 2551Q returns in JuanTax. BIR Form 2551Q, or also known as Quarterly Percentage Tax Return are taxes imposed on individuals/businesses who sells/lease goods or services which are exempted from Value Added Tax (VAT) with annual sales not exceeding 3,000,000 PHP. Before you generate your 2551Q report, you first need to configure your reports as they're intended for Percentage Tax during organization setup. To generate your percentage tax report, just go to the Percentage Tax Return section in your dashboard, then proceed to 2551Q tab. 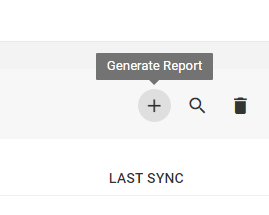 then start adding your report by clicking the Generate Report (+) icon. Choose the year and quarter(month) of your percentage tax report, then click the Generate button to add it in your list of reports. For the Total Amount Payable/(Overpayment), there is a section wherein once the amount goes negative, you need to choose whether the overpayment shall be used for either (1) To be refunded or (2) To be issued a Tax Credit Certificate. In JuanTax, all you need to do is go to Summary and proceed to Section 20A) Creditable Percentage Tax Withheld Per BIR Form No. 2307 and click the Add button. Enter the amounts in the fields and hit Save. Once entered, you will encounter this window where you will need to allocate the overpayment. Choose the necessary radio button to continue. See a preview of the report by going to the Report tab.